It wasn't after his fourth state championship, which would be earned later that night. 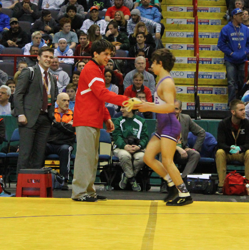 Instead, he was celebrating the eighth grader who captured the 99 pound NYS title - his brother Greg Diakomihalis. "Greg winning was the best part of the weekend for me," Yianni Diakomihalis said. "I was really happy for him. He wrestled really well the whole tournament. There's a lot of pressure on him because I won as an eighth grader and it's the first year some people started comparing us. I'm just so happy to see him have success." Yianni Diakomihalis joined Hilton head coach Craig Gross in Greg's corner throughout the tournament. But the junior said he generally tries to let his brother "do his own thing." "We're very different people - our personalities and as wrestlers," Yianni Diakomihalis said. "As much advice as I give him, I want him to do what makes him feel ok. The way I get myself ready for matches is totally different. When I'm getting ready to wrestle, there's a smile on my face and I'm relaxed and loose. He gets nervous and he actually wrestles better when he's nervous. He told me [before the finals], 'Don't calm me down; let me be nervous and I'll wrestle better.' So I let him squirm a little bit." Greg Diakomihalis admitted that he felt the jitters as the championship match approached. He was set to face Dylan Ryder of Half Hollow Hills West, a wrestler who defeated him in a tight 3-2 match in the title bout at the Eastern States Classic in January. "When I was getting warmed up, I really didn't think I was gonna win the match," Greg Diakomihalis said. "I actually was nervous that I was gonna get killed in front of a bunch of people." But when the whistle blew, things changed. "Once I fought off the first shot, I felt better," he said. "Then, I took him down and I thought, ok, I can win this match. At Eastern States, I wrestled kind of conservatively. I knew I needed to be more active. Pretty much the game plan was to attack in the first period." He took a 5-0 lead after the opening stanza and never looked back in a 7-4 victory. "I was pretty excited," Greg Diakomihalis said. "I couldn't tell you what was going through my mind after it was over. I was just really happy." Happy is also how he described himself after his closest bout of the tournament, a 7-6 win over Anthony Sciotto of Rocky Point in the quarterfinals. In an exciting match from start to finish, Diakomihalis escaped with short time remaining in the third period to earn the victory in a back-and-forth bout which featured multiple reversals and plenty of back points. "I was excited after that match. It got my adrenaline going," Greg Diakomihalis said. "That was a stressful one." That's a fair description of the first state championship that Yianni Diakomihalis won, as an eighth grader in 2013. He prevailed in triple overtime at 99 pounds against Syosset's Vito Arujau (the only loss of three-time NYS champ Arujau's high school career). While Diakomihalis has added three NYS titles since, he said that one is his most memorable. "It was 100% my toughest state finals match," Yianni Diakomihalis said. "Vito's one of the best wrestlers in the country and he's my friend. I probably gave my parents a severe heart attack in that match. Since then, I've been more dominant in my finals matches and I think I started to really establish myself." What does he feel has changed the most during his four-year run? "I think I grew up - I'm physically more mature, I'm faster and I'm stronger," he said. "I'm not so dependent on one thing - a single leg or a cradle. I've developed other ways to score. I hit a go behind and high crotch in the finals. I just look to keep improving. Even if it's just one or two moves at a time, I want to open my offense up more. Every year, I'm developing new things to get better." His list of achievements is well known, with several national titles at events like FloNationals and the Super 32 Challenge as well as a Cadet World Championship this past summer in Bosnia. In addition, this season he took over the New York State record for most consecutive victories, previously held by Nick Piccininni of Ward Melville. He said his streak currently stands at 199 straight wins. And even though it was a long time ago, he remembers very clearly 200 matches ago when he last tasted defeat in New York State. "It was at the SuperSectionals when I was in seventh grade in the semis," Yianni Diakomihalis said. "Bryan Lantry [of Wayne and now the 133-pound starter for Buffalo] beat me 7-1. It was 0-0 after the first and in the second, I got turned and then escaped, so it was 2-1. I went to run a bar in the third and got reversed to my back. I definitely learned a lesson, but I never got to wrestle him again." When he broke the record this season, Diakomihalis said he didn't know until a few days later. "It didn't really occur to me - I wasn't aware of it at the time," he said. 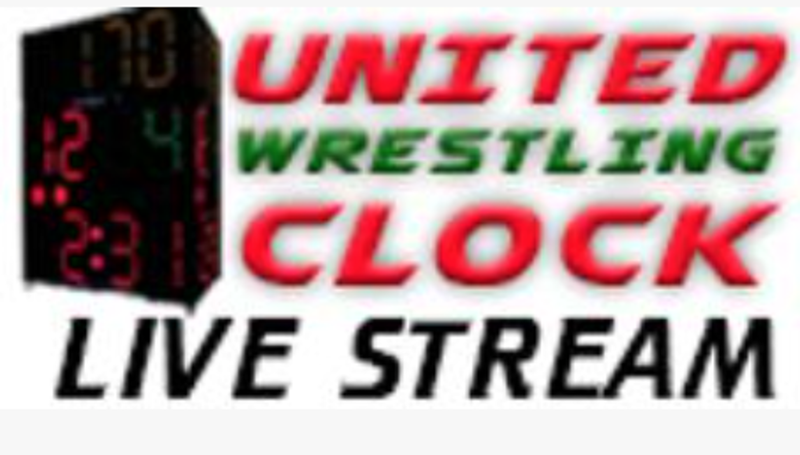 "It was at the U-E [Union-Endicott] Duals and I was focused on our team." At that event, Hilton took second, losing to Long Beach in a 34-31 championship dual that came down to the last seconds of the final bout. However, the Cadets, ranked nationally by Intermat, captured their third consecutive state tournament title over the weekend, led by individual golds from the Diakomihalis brothers and Louie DePrez (170) as well as significant points from Austin Hertel and Mike Spallina. "It's really fun being on this team," Greg Diakomihalis said. "I think next year we'll be even better." "It's really awesome," Yianni Diakomihalis added. "I think we'll be equally if not more successful next year. Every wrestler who won matches for us at the state tournament, is back. Our younger guys are getting better and we have some more guys who can get to the state tournament. We did a good job this weekend. I want to mention how awesome [170 pounder] Louie [DePrez] was. He's a two-time state champ now. Last year he won the title, but this year, he killed everybody. This year he made a really big jump." 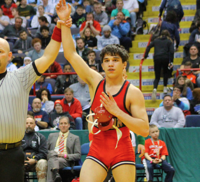 Those types of big jumps come from training all over with great wrestlers and coaches inside and outside New York State, including in Ithaca where Yianni Diakomihalis is committed to wrestle for Cornell. "I enjoy Finger Lakes Wrestling Club practices," he said. "I've had the chance to wrestle with really good partners like Nahshon Garrett at RTC practice in the offseason. It's pretty obvious that he's really, really good. That was a huge eye opener for me. It showed me I have a lot of work to do to succeed at the Division 1 level." It's not time for Diakomihalis to take the mat in college yet, of course, as he still has his senior season at Hilton in which he'll be looking to match another Big Red wrestler, Troy Nickerson, who is currently the only five-time state champion in New York State history. 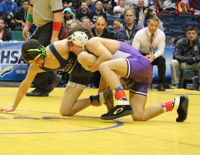 Yianni Diakomihalis gave himself that opportunity after his major decision in the finals over Fox Lane's Matt Grippi last weekend at 138 pounds, making him a part of the very select group of four-time NYS titlewinners. "It's really cool," he said. "It's an elite club. There haven't been 10 people in New York State wrestling history to win four titles. But at the same time, I'm only a junior. I can't be content with four. It's awesome, but I have an opportunity to win a fifth one, so I gotta keep moving forward until I get five." In 2017, Yianni Diakomihalis will be striving for five. With Greg Diakomihalis joining the champions party this year, who knows how many gold medals the Diakomihalis family will have when it's all said and done. Yianni & Greg Diakomihalis wanted to thank their family, coaches, training partners and everyone else who supports them. They will be hitting the mats looking to make World Teams at the Cadet (Greg) and both Junior and Cadet (Yianni) levels.